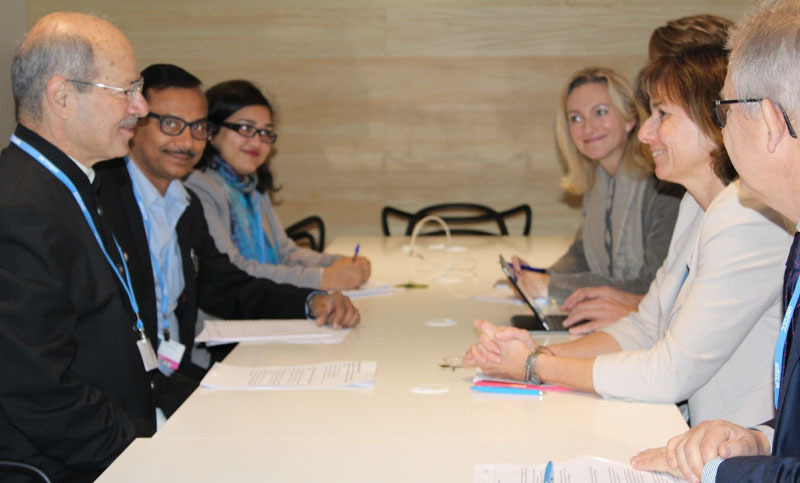 The Minister of State for Environment, Forest and Climate Change (Independent Charge), Shri Anil Madhav Dave and the Swedish Minister for International Development Cooperation and Climate and Deputy Prime Minister, Ms. Isabella Lovin holding discussions, at a bilateral meeting at COP 22, in Marrakech, Morocco on November 17, 2016. The Ministers of Brazil, South Africa, India and China (BASIC) met in Marrakech, Morocco, to take stock of the progress achieved thus far in the Marrakech Climate Conference (COP22/CMP12/CMA1) and to compares notes on further work required, as this important conference enters its final days. They conveyed their appreciation to the Kingdom of Morocco for hosting the conference and for the warm hospitality. The Ministers reiterated their unwavering commitment to the United Nations Framework Convention on Climate Change (UNFCCC) and noted the enduring relevance of the Convention’s principles and provisions, such as equity and CBDR & RC to successfully tackling one of the most serious challenges of our times. The Convention and its Kyoto Protocol and Paris Agreement provides the primary platform for inclusive and fair collective action by the international community to urgently address climate change, informed by the latest science. In this regard, the Ministers welcomed the early entry into force of the Paris Agreement, which represents the best contract possible in balancing the circumstances of all countries and thereby the best opportunity for the international community to reverse the disruption of the Earth’s climate systems caused by human activities. This is the time for urgent action. The direction of travel from Paris is irreversible. There can be no backtracking on commitments by developed Parties, and no attempts to renegotiate the terms of the pact reached in Paris. Parties must live up to their responsibilities. Ministers vowed to continue and strengthen the leadership role their countries have demonstrated – both in negotiations in the UNFCCC and in terms of concrete action on the ground, to reduce emissions, and to adapt to climate change impacts. The Ministers therefore stressed the urgency of enhancing pre-2020 action and ambition, and they emphasized the importance of the Doha Agreement entering into force without further delay and also the realization of the goal of mobilizing $100 billion per year of climate finance by 2020. The Marrakech Climate Change Conference is an implementation and action-oriented COP and has provided the BASIC countries and many others, with a useful platform for launching action initiatives. The Ministers expressed full confidence that a direct and legally sound way would be found at the Conference to progress with the technical work required to operationalize the Paris Agreement in a balanced and comprehensive manner, including anchoring the Adaptation Fund under the Paris Agreement and ensuring that all mandates are allocated to specific bodies. The BASIC Ministers will continue to advance the legitimate interests of all fellow developing countries, with emphasis on the needs of developing countries particularly vulnerable to the adverse effects of climate change, but who are historically least responsible for causing it. In this context, the Ministers stressed that adequate means of implementation support, in the form of new and additional climate finance, technology transfer and capacity-building, for all developing countries that require it, is indispensable if we are to meet the temperature reduction goals and adaptation goal set out in the Paris Agreement.